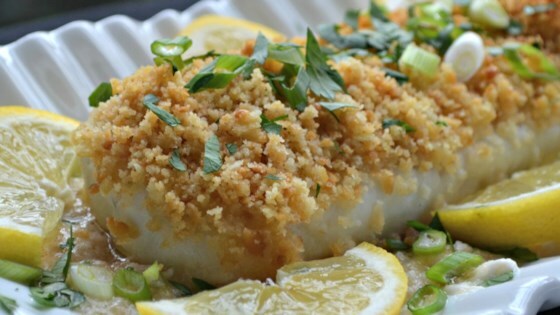 "Simple, fast, and delicious describes this baked cod recipe. Bake for two sets of 10 minutes each and you have the perfect ten dinner! This recipe was a favorite request from a local restaurant. They closed after years in business and we are happy to share a version of their most requested recipe. I serve this with rice pilaf and fresh spinach that has been lightly seared in olive oil and garlic. Yummy!" EXCELLENT! Prepared entire dish, then baked about 20-30 min. Added shredded Parmesan and green onion to the cracker mix. FANTASTIC!